There are countless funny and attractive videos published on YouTube which can be downloaded to watch on your devices. But what if you want only the audio of these video files? 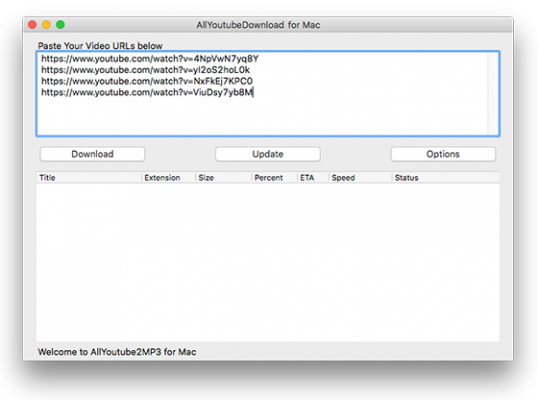 AllYoutubeDownload for Mac is a universal YouTube downloader and converter that can help you convert YouTube to Audio in verious formats like AAC, WAV, FLAC, OGG, WMA, etc. Why Convert YouTube to AAC on Mac? Have you ever found some fantastic music videos from YouTube and were so crazy for them. Instead of taking several hours to search out the name of the background music and finding correct resource to download, you can directly download the YouTube video to any audio format you need like AAC. AllYoutube2MP3 for Mac makes YouTube to audio conversion much easier with the user friendly interface and even beginners can finish their conversion with hassle. Why Convert YouTube to WAV on Mac? Looking to extract some music from YouTube, but leave the video behind? Or want the background music of YouTube video in WAV format to play on your portable devices? Here AllYoutube2MP3 for Mac can help you to make it. It combines YouTube video downloader and converter together, making you directly enjoy the YouTube audio offline! Why Convert YouTube to FLAC on Mac? As the most popular online video sharing website around the world, billions of visitors come to YouTube to download their favorite videos for offline enjoyment. What if you just want to extract audio from YouTube and convert it to FLAC format which is compressed without any loss in quality. When it comes to capture audio from YouTube, how could it be possible to get this job done without the top-notch AllYoutube2MP3 for Mac? It can flawlessly convert YouTube video to FLAC and tons of other audio formats with nary quality loss. Why Convert YouTube to OGG on Mac? Sometimes you might need to extract audio from YouTube and convert it to OGG format to be able to listen to on your music player. That can be quite easy if you use AllYoutube2MP3 for Mac. It has the ability to batch download multiple YouTube videos and convert them into any video or audio formats you might need. 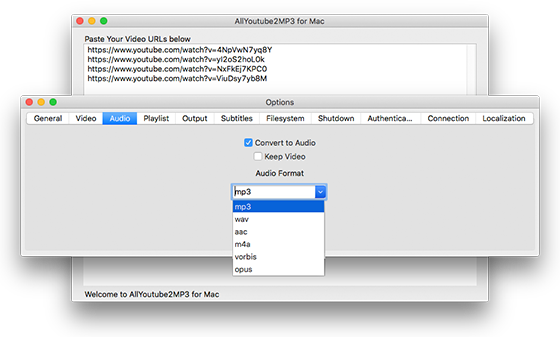 Why Convert YouTube to WMA on Mac? Have you found some great audio on YouTube but wished you could listen to it on your music player at your leisure time? In that case, you need to convert the YouTube video to WMA or other audio formats. With AllYoutube2MP3 for Mac, the process will be easier than ever and not only YouTube videos but also videos from any other websites can be converted into wanted formats effortlessly.